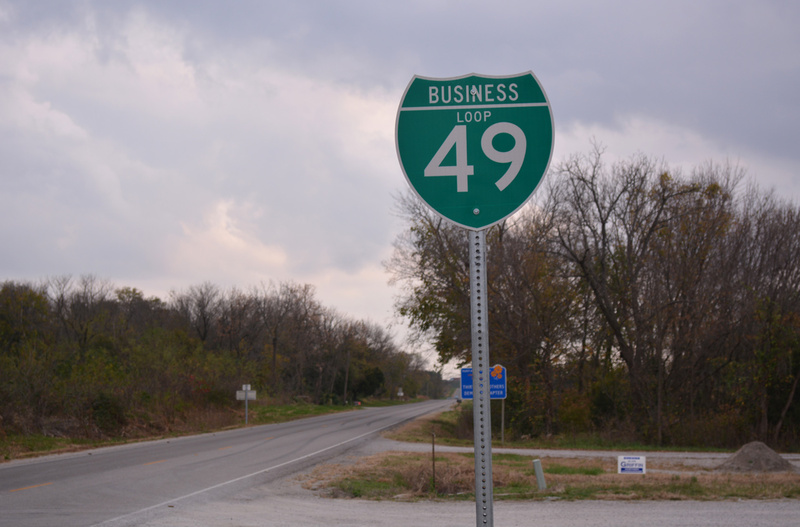 Interstate 49 has four designated business loops, all of which are in Missouri and were signed at the same time the route was commissioned in the Show Me State. AASHTO conditionally approved the routes on October 13, 2011. The business loops for Interstate 49 eliminated those previously posted for U.S. 71.
Business Loop I-49 in Neosho begins at a rural diamond interchange (Exit 20) with Highway AA southwest of the Neosho city limits. The initial leg of the business route stems east to Missouri 59 (old U.S. 71) at McElhany over a locally maintained roadway. Combining with MO 59, Business Loop I-49 leads north past Neosho Hugh Robinson Memorial Airport (EOS) and Neosho Industrial Park (part of which was formerly Fort Crowder) to U.S. 60. MO 59 turns east along side U.S. 60 across south Neosho, while Business Loop I-49 briefly combines with U.S. 60 Business (Neosho Boulevard) northward. The U.S. 60 business loop angles northeast to the Neosho city center while Business Loop I-49 remains along old U.S. 71 to the west. MO 86 joins the business route from Harmony Street for the return to Interstate 49 at Exit 27. The 9.74 mile loop was formally established on December 12, 2012 with all of I-49 in Missouri. Traveling 22.53 miles overall, Business Loop I-49 follows old U.S. 71 northwest from Exit 33 to Joplin and Webb City and Missouri 171 east from Cartersville to I-49 at Carthage. The route was established in place of U.S. 71 Business on December 12, 2012. Beginning opposite Missouri 175 (old U.S. 71 south to MO 86 and the Neosho business route), Business Loop I-49 winds northwest along Gateway Drive, a locally maintained roadway, to become Rangeline Road through the city of Joplin. A diverging diamond interchange (DDI) joins Business Loop I-49 with I-44 at Exit 8. Rangeline Road forms a commercial boulevard northward across the east side of Joplin to Business Loop I-44 & MO 66 and Northpark Mall. The former route of U.S. 71 used to have a second business route, which looped west via 32nd Street (Highway FF) and north via Main Street (Business Loop I-44 & MO 43) to Downtown Joplin. The original U.S. 71 Business took a stair stepped route back to U.S. 71 from Broadway Street to Zora Street at Oakland Park. Business Loop I-49 continues north from there into Webb City along Madison Street to Missouri 171 (5th Street), where the route turns east along an expressway to the Missouri 249 freeway bypassing Webb City. The remainder of Business Loop I-49 overlaps with the Missouri 171 freeway east through Cartersville to the Jasper County seat of Carthage. The business route combines with MO 96 ahead of the diamond interchange (Exit 53) with Interstate 49 at Central Avenue. There MO 171 ends and MO 571 begins as I-49 & U.S. 71 bypass the city to the west. Business Loop I-49 in Nevada forms an L-shaped route west from Exit 101 and north to a wye interchange at Exit 102B. The 2.93 mile route follows Austin Boulevard west to U.S. 54 (Centennial Boulevard), which overlaps with Business Loop I-49 west to Osage Boulevard outside Downtown. Osage Boulevard meanders northward and parallels a Missouri & Northern Arkansas (MNA) Railroad Company line to end at Interstate 49 by Atlantic Avenue. 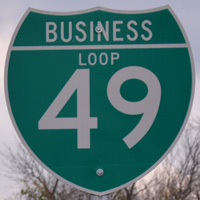 Business Loop I-49 in Nevada was known as Business U.S. 71 until December 12, 2012. Established on December 12, 2012, the 6.109 mile route of Business Loop I-49 intertwines with I-49 & U.S. 71 northward from Exit 130 to Exit 136. The route connects the freeway with the west side of Butler via Orange Street north from a wye interchange with I-49 as part of Missouri 52 to Fort Scott Street. MO 52 branches west to Exit 131 and Amoret while Business Loop I-49 remains northward along a MNA Railroad line to Butler Airport (BUM). The northernmost 1.25 miles shift west of I-49 to Park Street in the village of Passaic. Highway D concludes the route at I-49 & U.S. 71, east of Highway F (Conklin Street). Page updated August 29, 2016.